Amid the Wasteland remains of a world destroyed by a devastating Global Thermonuclear Armageddon, barbaric tribes rule the New American Dark Age. A boy and his horse must complete the final mission of the last American soldier. 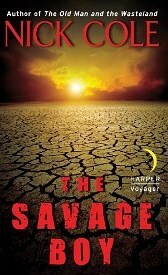 What unfolds is an epic journey across a terrifying post-apocalyptic tribal America gone savage - "Jack London" meets the "End of the World". You take everything with you. That is the last lesson. The last of all the lessons. The last words of Staff Sergeant Presley. You take everything with you, Boy. The Boy tramped through the last of the crunchy brown stalks of wild corn, his weak left leg dragging as it did, his arms full. He carried weathered wooden slats taken from the old building at the edge of the nameless town. He listened to the single clang of some long unused lanyard, connecting against a flagpole in the fading warmth of the quiet autumn morning. Staff Sergeant Presley was gone now. The last night had been the longest. The old man that Staff Sergeant Presley had become, bent and shriveled, faded as he gasped for air around the ragged remains of his throat, was gone. His once dark, chocolate brown skin turned gray. The muscles shriveled, the eyes milky. There had been brief moments of fire in those eyes over the final cold days. But at the last of Staff Sergeant Presley there had been no final moment. All of him had gone so quickly. As if stolen. As if taken. The cold wind thundered against the sides of Gas Station all night long as it raced down from mountain passes far to the west. It careened across the dry whispering plain of husk and brush through a ravaged land of wild, dry corn. The wind raced past them in the night, moving east. A week ago, Gas Station was as far as Staff Sergeant Presley could go, stopping as if they might start again, as they had so many times before. Gas Station was as far as the dying man could go. Would go. I gotcha to the Eighty, Boy. Now all you got to do is follow it straight on into California. Follow it all the way to the Army in Oakland. Now, in the morning’s heatless golden light, the Boy came back from hunting, having taken only a rabbit. Staff Sergeant Presley’s sunken chest did not rise. The Boy waited for a moment amongst the debris and broken glass turned to sandy grit of Gas Station, their final camp. He waited for Sergeant Presley to look at him and nod. But he did not. Staff Sergeant Presley lay unmoving in his blankets. The Boy went out, crossing the open space where once a building stood. Now, wild corn had grown up through the cracked concrete pad that remained. He crossed the disappearing town to the old wooden shamble at its edge, maybe once a barn. Working with his tomahawk he had the slats off with a sharp crack in the cool, dry air of the high desert. Returning to Gas Station, he knew. The Boy crossed the open lot. Horse looked at him, then turned away. And there was something in that dismissal of Horse that told the Boy everything he needed to know and did not want to. Staff Sergeant Presley was gone. He laid the wood down near the crumbling curb and crossed into the tiny office that once watched the county road. Staff Sergeant Presley’s hand was cold. His chest did not rise. His eyes were closed. The Boy sat next to the body throughout that long afternoon until the wind came up. The Army is west. Keep going west, Boy. When you find them, show them the map. Tell them who I was. They’ll know what to do. Tell them Staff Sergeant Lyman Julius Presley, Third Battalion, 47th Infantry, Scouts. Tell them I made it all the way—all the way to D.C., never quit. Tell them there’s nothing left. No one. Don’t let that tomahawk fly unless you’re sure. Might not get it back. These were all towns. People once lived here. Not like your people. This was a neighborhood. You could have lived here if the world hadn’t ended. Gone to school, played sports. Not like your tents and horses. There are some who still know what it means to be human—to be a society. There are others … You got to avoid those others. That’s some craziness. For a day the Boy watched the body. Later, he wrapped Staff Sergeant Presley in a blanket; blankets they had traded the Possum Hunters for, back two years ago, when their old blankets were worn thin from winter and the road, when Staff Sergeant Presley had still been young and always would be. At the edge of the town that once was, in the golden light of morning, the Boy dug the grave. He selected a spot under a sign he could not spell because the words had faded. He dug in the warm, brown earth, pushing aside the yellowed, papery corn husks. The broken and cratered road nearby made a straight line into the west. When the body was in the grave, covered, the Boy waited. Horse snorted. The wind came rolling across the wasteland of wild corn husks. Find the Army, Boy. All the way west, near a big city called San Francisco. Tell them there’s nothing left and show them the map. When he could still speak, that was what Staff Sergeant Presley had said. Which seemed something more than just a lesson. The road and the map gave the number 80. For a time he knew where he was by the map’s lines and tracings. He alone would have to know where he was going from now on. I followed him from the day he took me. Now I will need to lead, even if it is just myself and Horse. Horse grazed by the side of the broken and cracked highway. The short days were cold and it was best to let Horse eat when they could find dry grass. The Boy considered the snow-capped mountains rising in the distant west. Sergeant Presley would’ve had a plan for those mountains. You should be thinking about the snow, not about me, Boy. The voice of Sergeant Presley in his head was strong, not as it had been in the last months of his life when it was little more than a rasp and in the end, nothing at all. You’re just remembering me as I was, Boy. You can’t think of me as someone who can get you outta trouble. I’m dead. I’m gone. You’ll have to take care of yourself now, Boy. I did all I could, taught you everything I knew about survival. Now you got to complete the mission. You got to survive. I told you there’d be mountains. Not like the ones you knew back east. These are real mountains. They’re gonna test you. Let me go now and keep moving, Boy. The sun fell behind the mountains, creating a small flash as it disappeared beyond the snow-capped peaks. Horse moved forward in his impatient way. The Boy massaged his bad leg. This was the time when it began to hurt: at the end of the day as the heat faded and the cold night began. Sometimes it’s better to ride through the night, Boy. Horse’ll keep you warm. Better than shiverin’ and not sleepin’. But stick to the roads if you do go on. The Boy rode through the night, listening to Horse clop lazily along, the only sound for many hours. He watched his breath turn to vapor in the dark. I should make a fire. The Boy continued on, listening to Sergeant Presley’s voice and the stories he would tell of his life before the Boy. Later, the Boy limped alongside Horse thinking of “Reno,” and “Slave Camp” and “Billings” and “Influenza” and “Plague” and especially “Gone,” which was written next to many of the places that had once been cities. All the words that were written on Sergeant Presley’s map. And the names too. In the night, the Boy and Horse entered a long valley. The old highway descended and he watched by moonlight its silver line trace the bottom of the valley and then rise again toward the mountains in the west. Below, in the center of the valley, he could see the remains of a town. Picked over. Everything’s been picked over. You know it. I know it. It is known, Boy. Still you’ll want to have your look. You always did. For a long time the Boy sat atop the rise until Horse began to fidget. Horse was getting crankier. Older. The Boy thought of Sergeant Presley. He patted Horse, rubbing his thick neck, then urged him forward not thinking about the slight pressure he’d put in his right leg to send the message that they should move on. The Boy kept Horse to the side of the road, and in doing so he passed from bright moonlight into the shadows of long-limbed trees that grew alongside the road. He watched the dark countryside, waiting for a light to come on, smelling the wind for burning wood. Food. A figure moving in the dark. At one point he put his right knee into Horse’s warm ribs, halting him. He rose up, feeling the ache across his left side. He’d smelled something. But it was gone now on a passing night breeze. Sergeant Presley had avoided towns, people, and tribes whenever possible. These days no good ever comes of such places, Boy. Society’s mostly gone now. We might as well be the last of humanity. At least, east of Frisco. On the outskirts of a town, he came upon a farmhouse long collapsed in on itself. I can come back here for wood in the morning. Down the road he found another two-story farmhouse with a wide porch. These are the best, Boy. You can hear if someone’s crossing the porch. You can be ready for ’em. The Boy dismounted and led Horse across the overgrown field between the road and the old house. He heard the soft and hollow hoot, hoot of an owl. He watched the wide night sky to see if the bird would cross. But he saw nothing. He dropped Horse’s lead and took his crossbow from its place on the saddle. He pulled a bolt from the quiver in his bag and loaded the crossbow. Horse would move when he moved. Stop when he stopped. The Boy’s left side was stiff. It didn’t want to move and he had to drag it to the porch making more sound than he’d wished to. He opened the claw his withered left hand had become and rested the stock of the crossbow there. Again the owl. He heard the leathery flap of wings. Your body will do what you tell it to, regardless of that broken wing you got, Boy. The Boy took a breath and then silently climbed the rotting steps, willing himself to lightness. He crossed the porch in three quick steps, feeling sudden energy rush into his body as he drew his tomahawk off his belt. Crossbow in the weak left hand, waiting, tomahawk held high in his strong right hand, the Boy listened. He pushed gently, then firmly when the rotten door would not give. Inside there was nothing: some trash, a stone fireplace, bones. Stairs leading up into darkness. When he was sure there was no one else in the old farmhouse he went back and led Horse inside. Working with the tomahawk he began to pull slats from the wall, and then gently laid them in the blackened stone fireplace. He made a fire, the first thing Sergeant Presley had taught him to do, and then closed the front door. Don’t get comfortable yet. If they come, they’ll come soon. He could not tell if this was himself or Sergeant Presley. The Boy stood with his back to the fire, waiting. When he heard their call in the night, his blood froze. It was a short, high-pitched ululating like the sound of bubbling water. First he heard one, nearby. Then answers from far off. You gotta choose, Boy. Git out or git ready. The Boy climbed back onto Horse, who protested, and hooked the crossbow back into its place. He pulled the tomahawk out and bent low, whispering in Horse’s ear, the ceiling just above his head. It’ll be fine. We can’t stay. Good Horse. I don’t know if he agrees, thought the Boy, but it doesn’t matter, does it? The face that appeared in the window was chalk white, its eyes rimmed in black grease. That’s camouflage, Boy. Lets him move around in the night. These are night people. Some of the worst kind. The eyes in the window went wide, and then the face disappeared. He heard two quick ululations. The Boy kicked and aimed Horse toward the front door. Its shattered rottenness filled the Boy’s lungs as he clung to Horse’s side and they drove through the opening. He saw the shadow of a man thrown back against a wooden railing that gave way with a disinterested crack. Other figures in dark clothes and with chalk-white faces crossed with black greased stripes ran through the high grass between the road and the farmhouse. The Boy kicked Horse toward an orchard of ragged bare-limbed trees that looked like broken bones in the moonlight. Once in the orchard, he turned down a lane and charged back toward the road. Horse’s breathing came labored and hard. “You were settling in for the night and now we must work,” he whispered into Horse’s twitching ears. Ahead, one of the ash-white, black-striped figures leaped into the middle of the lane. The figure planted his feet, then raised a spear-carrying arm back over his shoulder. The Boy tapped twice on the heaving flank with his toe and Horse careened to the right, disagreeing with a snort as he always did. You wanted to run him down, thought the Boy. They made the road leaping a broken fence. He stopped and listened. The Boy could hear the ululations behind them. He heard whistling sounds also. Down the road quickly, get outta Dodge now, Boy! He took the road farther into town, passing the crumbling remains of warehouses and barns long collapsed. Stone concrete slabs where some structure had burned down long ago rose up like gray rock in the light of the moon. Sergeant Presley had always spoken simply at such places. The Boy didn’t know the meaning or purposes of such places and only possessed vague notions of form and function when he recognized their remains. In the center of town he saw more figures and brought Horse up short, hooves digging for purchase on the fractured road. The Ashy Whites formed a circle and within were the others. The Ashy Whites were standing. The others sat, huddled in groups. “Help us!” someone cried out and one of the Ashy Whites clubbed at the sitting figure. Behind him, the Boy could hear the ululations growing closer. Horse stamped his hooves, ready to run. No time for memories, Boy! Horse reared up and the Boy had to get hold of the mane to get him down and under control. Once Horse was down and settled, the Boy stared about into the blackness, seeing nothing, not even the moonlight. Just the bright shining light coming from where the Ashy Whites had been. An Ashy White, large and fat, his face jowly, his lower lip swollen, his eyes bloodshot, stepped into the light from the darkness off to one side. He was carrying a gun. What type of gun is this, Boy? When they’d found empty guns Sergeant Presley would make him learn their type, even though, as he always said, They were no good to anyone now. How could they be? After all these years there ain’t no ammunition left, Boy. We burned it all up fightin’ the Chinese. The Ashy White man walked forward pointing the shotgun at Horse. What will it do? He heard Sergeant Presley ask. The Ashy White continued to walk forward with all the authority of instant death possessed. There can’t be any ammunition left. Not after all these years, Boy. He kicked Horse in the flanks and charged the man. Pinned ears indicated Horse was only all too willing. Sometimes the Boy wondered if Horse hated everyone, even him. In one motion the Boy drew his tomahawk. The man raised the weapon. Don’t let it go unless you mean to, might not get it back, Boy. He always heard Sergeant Presley and his words, every time he drew the tomahawk. He was seventeen years old. The world as Sergeant Presley had known it had been over for twenty-three years when the Boy whose own name even he had forgotten had been born on the windswept plains of what the map had once called Wyoming. You strike with a tomahawk. Never sweep. It’ll get stuck that way Boy. Timing has to be perfect. Jowls raised the shotgun, aiming it right into the Boy. There can’t be any ammunition left, Boy. The world used it all up killing itself. And the Boy struck. Once. Down. Splitting the skull. He rode off, out of the bright light and into the darkness. Nick Cole is a working actor, living in Southern California. When he is not auditioning for commercials, going out for sitcoms, or being shot, kicked, stabbed, or beaten by the students of various film schools for their projects, he can often be found playing the role of guard for King Phillip the Second of Spain in the Opera Don Carlo at the Los Angeles Opera or some similar role. Nick Cole has been writing for most of his life and acting in Hollywood, after having served his country in the U.S. Army. 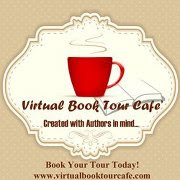 Click HERE or on the banner below to find out where The Savage Boy will appear next on this exciting virtual book tour. 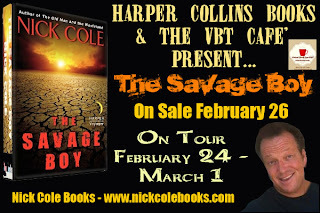 And download your copy of The Savage Boy by Nick Cole for Nook or Kindle today and read to tell about it!